From US Route 7, a winding road leads through a pastoral yet intriguing landscape. Busy interstates recede in your rear-view mirror, leaving only the summer breeze and the idle hours ahead. Nestled between stone walls, dense woods, and historic red buildings stands the entrance to Weir Farm National Historic Site. The countryside brims with life: a junior ranger triumphantly shows off her new badge, a family sits down to sketch together in the shade of an apple tree, a few old friends reunite on a weekend hike to Weir Pond, and, in the background, an artist paints the scene right before your eyes. Like the many travelers who've visited in recent years, American Impressionist Julian Alden Weir couldn't resist this special place. The farm's rolling hills, open fields, and relaxing pond entranced Weir, both as a busy 1880's New Yorker looking for a summer home and as an artist longing to paint. Today, the 60-acre park includes not only these iconic New England features, but also the historic house and studios that fostered artistic creation at the park for 130 years. As the only national park devoted to American painting, Weir Farm National Historic Site reminds us that “fine art” isn't reserved for a select group. Weir broke with artistic tradition, embraced new techniques, and painted what he personally found fine in art: intimate scenes of his beloved family and home. Through his highly accessible style of Impressionism, Weir showed a newly industrialized America that beauty still resides in the natural world. Thanks to the efforts of a dedicated group of concerned citizens, you too can escape to this rural retreat and see the world like Weir did, as a place of peace and inspiration. 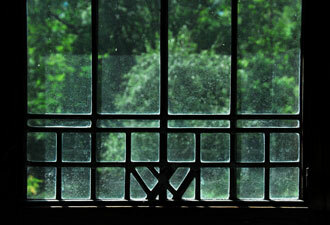 Restoration of the park's historic Weir House, Weir Studio, and Young Studio won't be complete until later in 2013, but there is still plenty to look forward to when you plan your visit. Start with a guided tour of the landscape to discover why three generations of American artists found inspiration here. Want to explore the landscape on your own? Grab a painting sites guide and walk in the footsteps of artists past and present. You can create your very own painting with free-to-use art supplies provided by the park. Or, sign up for a seasonal Impressionist painting workshop taught by local artist instructors. 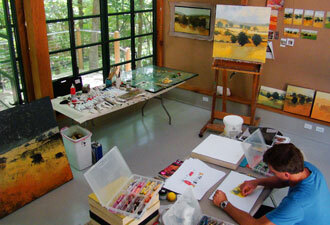 Professional artists can even live and create on-site through the park's artist-in-residence program! You don't need to paint to enjoy everything the park has to offer. After viewing the exhibits in the visitor center, head outdoors for a hike to scenic Weir Pond. There, you can try one of Weir's favorite pastimes: catch-and-release fishing! 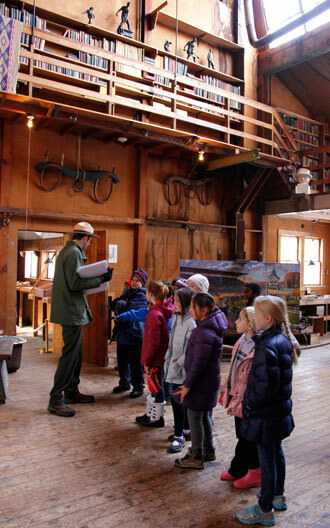 Kids can learn and have fun with the park’s two junior ranger programs. Are you a garden lover? Stop by the Sunken Garden near the visitor center. From there, you can walk through a field of wildflowers to the Secret Garden, famous for its rustic cedar fencing. Just be sure to bring a picnic blanket! Take some time out of your busy schedule to experience the landscape that inspired an American visionary. Whether you come to learn, to paint, or just to spend time with your friends and family, experience your America at Weir Farm National Historic Site!